Multiple lobe piercings can look pretty or edgy depending on the earrings you wear. The amount can totally differ too; I’ve spotted people wearing 3 simple diamond studs in one ear, and a range of different studs going all the way up the ear! Who needs an ear cuff when you can wear a load of different studs? I think it looks amazing! Some people just pull this off so well - even the ring! I do prefer a little diamond stud though, as I think it’s more feminine and subtle. Nothing too big, as this can overpower some people. I love belly piercings, as there are so many different bar styles you can wear. You can simply wear something with a coloured stone, or you can wear something really elaborate and dangly. Some are good for everyday wear while others will look fabulous on the beach! You’d have to be brave to have this done all at once, but it looks so pretty I don’t know how anybody could resist! 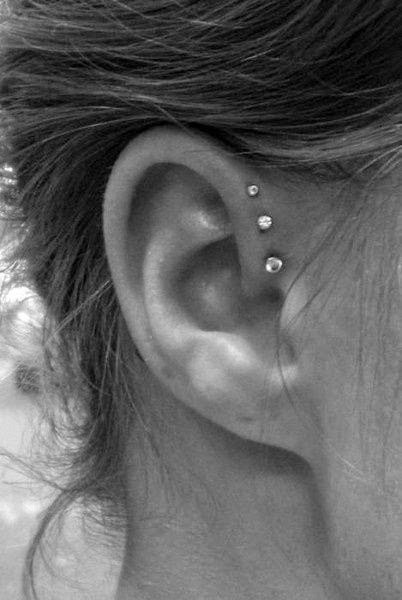 You have 3 small diamond studs at the top front part of your ear, perfectly spaced to make them look amazing. You can even choose 3 studs of slightly different sizes to make them look as if they taper off. You can have similar piercings to this all over the ear too; the double helix piercing is something that Kendall Jenner has. 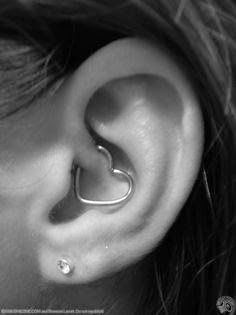 The daith piercing is a popular piercing thanks to that pretty little heart shaped body jewellery ring you can have in it! It’s probably the only ear piercing you can wear it in to show it off properly, but I’m no expert! Even Kylie Jenner has this one (it’s all about Keeping up with the Kardashians)! I’m not saying I would ever have this done; I don’t think it’s my style! The septum piercing isn’t the girliest piercing, but on the right person I think it can look amazing! I’ve spotted some really gorgeous girls rocking this piercing lately and making it look awesome. You can even find fake septum rings, so if you’re headed to a festival, on holiday or somewhere you want to experiment you can try it without committing to it! I think that’s as far as I’d go if I were feeling adventurous for a special occasion. There are so many more pretty piercings out there, but the ones in this post are definitely my favourite. It all depends on how you wear them and style them, and your own personal style to go along with it. 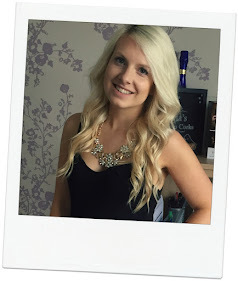 Whether you have no piercings, 1 piercing, or 35 piercings, we’re all gorgeous anyway!